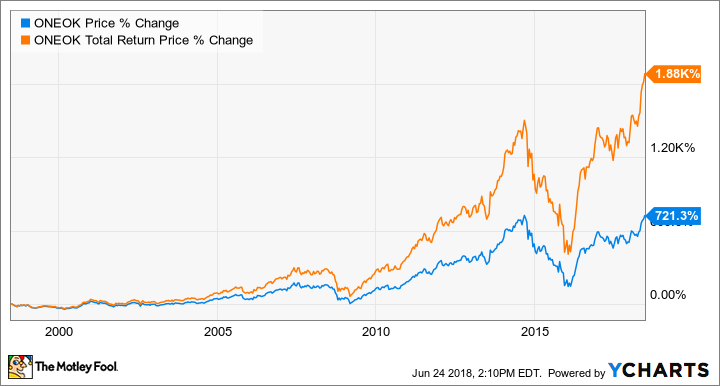 These two boring companies have generated exciting returns over the last two decades. Most investors don't get too excited about pipeline stocks. Maybe it's because they're not changing the world like tech or healthcare companies. However, while they might not generate exciting headlines, they can produce jaw-dropping returns if investors hold on for the long haul. Enterprise Products Partners came public nearly 20 years ago to little fanfare. The master limited partnership (MLP) raised a little under $250 million at the time to fund development projects and acquisitions. That seed money jump-started the company's growth journey, which has seen it become an energy infrastructure powerhouse over the years. As a result, initial investors have done quite well. Overall, Enterprise has generated a total return of more than 1,730%, which would have turned a $5,000 investment at its IPO into more than $86,500. For comparison's sake, the S&P 500's total return over that time frame is 268%, which would have turned $5,000 into just $13,400. A main driver of that return has been Enterprise's spectacular ability to increase its distribution to investors. Since its IPO, the MLP has increased its payout 64 times, including in each of the last 55 consecutive quarters. That growing income stream has generated the lion's share of the company's total return. ONEOK got its start more than a century ago as an interstate natural gas pipeline business in Oklahoma. Today, it's one of the largest midstream energy companies in the U.S., operating more than 38,000 miles of pipelines. A significant portion of that expansion has come in the past two decades, which has generated a windfall for investors. 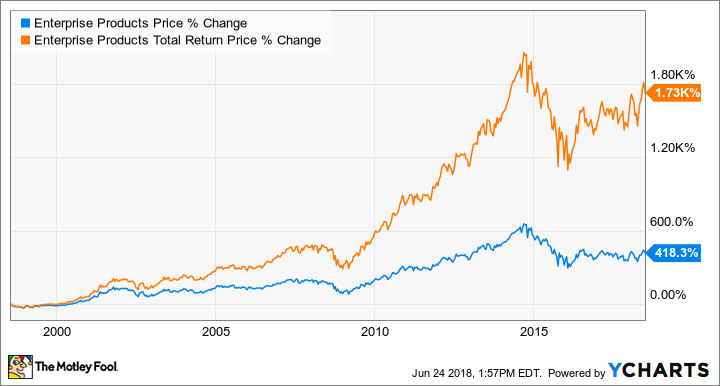 Overall, the pipeline giant has produced a total return of more than 1,890% in the last 20 years, which would have turned a $5,000 investment into more than $94,500. Like Enterprise, the bulk of that return came via the company's lucrative dividend. ONEOK expects to continue growing shareholder value in the coming years. It currently has about $4 billion of high-return expansion projects underway, which positions it to increase its high-yielding dividend at a 9% to 11% annual pace through 2021 and puts it in a class of its own. The company's ability to grow its high yield at a high rate has the potential to generate top-tier total returns for investors over the next few years. While exciting growth stocks grab most of the headlines, dividend growth stocks have historically outperformed their stingier peers over the long term. That has certainly been the case for these two pipeline companies for the last two decades. Meanwhile, with ample fuel to continue growing their dividends in the coming years, both of these pipeline companies appear poised to outperform in the future, making them excellent stocks to consider buying for the long run.